Stephens Automotive is leading the industry when it comes to fleet maintenance near Arlington Heights and the surrounding areas. Call Stephens Automotive if you are looking for fleet repair or truck fleet maintenance. We offer the best quality fleet maintenance services in the area. For more than 24 years we have provided outstanding fleet vehicle maintenance done by our 5 ASE Certified Technicians who have more than 100 years of combined experience. 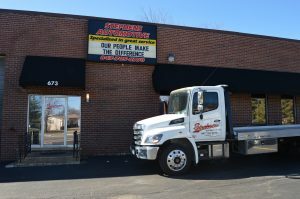 Stephens Automotive is a dependable company who has an excellent fleet repair reputation near Arlington Heights. Arlington Heights, Illinois is known for Arlington Park Race Track, home of the Arlington Million, a Breeders’ Cup qualifying event. Arlington Heights is a suburb of Chicago with a little over 75,000 residents. Stephens Automotive has been providing exceptional fleet maintenance service to Arlington Heights for more than 20 years. We have an outstanding reputation, and our 2,000 satisfied customers highly recommend us. Let our highly trained and certified technicians assist you with all your fleet maintenance services. Stephens Automotive has the most extensive fleet repair and fleet maintenance services in the area. Stephens Automotive offers fleet vehicle maintenance services for all makes and models. We have the latest top notched innovative diagnostic and fleet repair equipment to ensure quality fleet maintenance service. Come to the best, we guarantee all our work. Let us exceed your expectations. Set up an appointment with our experts today. Call Stephens Automotive at (847) 705-8770. We aim to please!